Let's get straight on with the fearsome five! NUMBER 5: "The Day The Earth Looked Stupid"
EERIE EVENTS: When a small town in the 1930s hears the news of an alien invasion, everybody goes APE CRAZY!!! ...But it's a hoax. Fooled once, they resolve never to be fooled again - making them the perfect target for an actual invasion! Can Orson Welles bring them to their senses? And will Operation Enduring Occupation ever end? PLOT 9 FROM OUTER SPACE: Not so much an outright plot nick this, as a reference to a real world happening. Orson Welles' 1938 radio broadcast of "War of The Worlds", despite being presented as drama, was infamously taken seriously by some, though the scale of the panic is disputed by boring spoilsports. (BLOOD) MAGIC MOMENT: "Now they're playing the xylophone while bowling near an airport!" TERROR RATING: 8 deus ex machina foilings of extraterrestrial threats via the common cold out of 10. 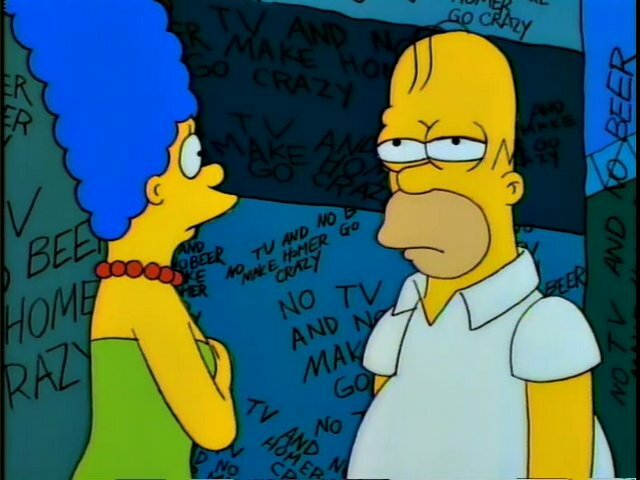 EERIE EVENTS: On leaving The Simpsons as winter caretakers at one of his properties, Mr Burns disconnects the television cable and removes all beer – but no TV and no beer make Homer SOMETHING SOMETHING!!! Their only hope is Groundskeeper Willie, summoned to their aid by Bart’s, erm, “shinn”. Will the family escape their psychotic patriarch? Or will Homer stop eating and stay focused long enough to seal the deal? PLOT 9 FROM OUTER SPACE: Erm… “The Shining”, obvs. Every second of this is a love letter to Stanley Kubrick’s 1980 adaptation of Stephen King’s novel. (BLOOD) MAGIC MOMENT: Quite literally. “Hmmmm... that's odd. Usually the blood gets off on the second floor." TERROR RATING: Another Coke, of course. NUMBER 3: "Time and Punishment"
EERIE EVENTS: When Homer Simpson tries to repair his family’s toaster, he unwittingly falls into TIME ITSELF!!! Our hapless hero can’t stop making crazy changes to the space-time continuum, landing him in a grotesque alternate timeline where Flanders is the ruler of all creation! Can Homer solve the problem with extreme violence, or will he find himself forcibly re-Ned-ucated? PLOT 9 FROM OUTER SPACE: Finally, I get to make my mother proud, after years of shaming her – I recognise this story from the science fiction short “A Sound of Thunder”, a Ray Bradbury short story from the collection "The Stars And Under". The protagonist is sent back in time to see dinosaurs in person, but winds up straying from the path and killing an insect, which causes reality to be different when he returns to his present day. It’s been referenced by many a time travel story, but this is a particularly precise call-out. TERROR RATING: 15 Doctors out of (a theoretical) 26. EERIE EVENTS: Space aliens! Naked conspiracies! And the harsh reality of a two-party system! Yes, there’s nothing more terrifying than AMERICAN POLITICS!!! When Kang and Kodos replace Bill Clinton and Bob Dole on the eve of the 1996 election, Homer is the only witness! Can he stop them from exchanging long protein strings, or will they move forward, not backward; upward, not forward; and always twirling, twirling, twirling towards freedom! (BLOOD) MAGIC MOMENT: “Don’t blame me. *I* voted for Kodos!” – bringing, as it inevitably does, no relief from the grind of eternal slavery to horrific space monsters/another Tory government (delete as satirically correct). Either that or an enraged Ross Perot punching his hat. TERROR RATING: 10 Kangs out of Kodos. EERIE EVENTS: Homer Simpson IS The Narrator! Marge Simpson IS Lenore! And introducing Bart Simpson as the titular Raven, in this, an adaptation of an OLD POEM!!! Seeking distraction from the death of his beloved, our narrator is unnerved by the presence of a raven in his house. Can he chase the sinister presence back to the Plutonian shore, or shall his soul be lifted nevermore? PLOT 9 FROM OUTER SPACE: In stark contrast to the homages we’ve seen in the previous entries, this simply *is* the 1845 poem “The Raven” by the king of the goths, Edgar Allen Poe. Whilst he would appear in "South Park", Poe would not make a return appearance in Springfield, although his gravestone is used by Dr Nick to demonstrate Spiffy! cleaner in "Saturdays of Thunder". (BLOOD) MAGIC MOMENT: Whilst this is a surprisingly faithful adaptation, there is one conceit to early Simpsons - the line "eat my shorts", which bizarrely has never been funnier than when presented this far out of context. TERROR RATING: 13 copies of “Disintegration” out of 10 - a macabre masterpiece. And that concludes our look at Treehouse of Horror! Join us tomorrow when we'll return to our normal schedule - until then, keep watching the skis! I mean: skies.